• How to order PrintFirm products? • What types of paper do you offer and what are the suggested uses? • How long will it take to upload my file? • Can I receive a printed proof? • Is PrintFirm, Inc. able to provide quotations for projects/tasks not listed on its website? • Can you bill me? • May I use my own shipping account? • Can I order a lower quantity than what you have listed? • Can I split print quantities? • Is there an extra charge for bleed? • Can I email my files? • Will I receive an invoice? • What do I do if I don't see the postcard size that I am looking for? • How do I get my tracking number? • What is blind shipping / drop shipping? • Is there a set-up fee for your standard images? • What do you mean by (4/0), (4/1) or 4/4)? • What type of shipping method do you use? • Do you offer any discounts or free items? • Can I request a sample for my portfolio? • Can I split shipping? How to order PrintFirm products? Scroll over to the sidebar on the left and click on Business cards. Click on the Get Started button under the Business Cards sub-category. Select your desired size, paper type, printed side, corner type, quantity and print turnaround. Add your files or Select Upload later for the sides you would like to upload later. What types of paper do you offer and what are the suggested uses? PrintFirm, Inc. currently offers five different paper types. Thick Premium 16 pt. Cardstock Paper - Ideal for Full Color Business Cards, Postcards, Rack Cards, Hang Tags, Table Tent Cards and Presentation Folders. Premium 14 pt. Cardstock Paper - Ideal for Full Color Business Cards, Postcards, Rack Cards, Door Hangers, Rolodex Cards and Presentation Folders. 100 lb. Gloss Text - Ideal for Flyers, Brochures, Posters, and Multi-page Catalogs. 70 lb. Gloss Text - Ideal for Flyers, Brochures, Posters, and Multi-page Catalogs. 100 lb. Textured Linen Cover Stock - Ideal for Matte finish (non-gloss) Business Cards, Greeting Cards, Thank You Cards and Note Cards. Linen Covers subtle embossed finish, like finely woven cloth, is truly elegant and a basic requirement for crisp business presentations. 70 lb. Bright White Premium Paper - Ideal for Smooth finish (non-textured), Full Color Letterheads and Envelopes, as well as writable Flyers and Brochures. 70 lb. Textured Line Paper - Ideal for Full Color Letterheads and Envelopes. Linen's subtle embossed finish is truly elegant and puts forth a Professional appeal. The length of time it takes to upload your file may vary, depending on your connection speed and content of what you are trying to upload. You may refer to the status bar on our upload page. We provide online proofs for all projects that we have * custom designed and/or that contain our standard images. You are able to receive up to two FREE proofs for any revisions, if any, on any one project. If you still need to make additional revisions, a third and final proof will be available for a $10.00 fee. We do provide free proofs (up to 2) for projects that you provide your own artwork for. However after 2-nd PDF proof you will be charged a $10.00 to $25.00 fee. We do not provide proofs for Flyers or Presentation Folders that are in Jpeg or TIFF format. For all other Flyer types, and Presentation Folder types, and for all Brochures, you will receive one FREE PDF proof. If after receiving your proof, you decide that you need to send us a new file, a second and final proof will be available for a $25.00 fee. * Due to the nature of gang-run printing, which can cause color-shifting, we are unable to provide printed (hard-copy) proofs. Is PrintFirm, Inc. able to provide quotations for projects/tasks not listed on its website? Yes. We welcome the opportunity to provide a quote for any printing project or task that you may have. Please note that our quotes are only good for 30 days from the day and time we submit your quote to you. After 30 days, we reserve the right to revise our quote. No. PrintFirm, Inc. requires full payment, including shipping and handling, prior to any order being processed. We accept money orders, checks, Visa, MasterCard, and American Express. We will not proceed until payment is received. Note: All checks must be cashed before your order is processed. Yes. You may pick up your order from our Canoga Park office, located in California. If you would like to pick-up your order, you can select the "Pick-up" option when placing your order. No. Due to the weight of our printed products, we are unable to accommodate shipments made to a P.O. Box address. If you entered a P.O. Box address in the place of your shipping address on our order form, your order will not be shipped out until we have first contacted you and received a non-P.O. Box address. No. Unfortunately, at this time, we are not able to accommodate any shipping accounts that are not our own. PrintFirm, Inc. is able to offer such low prices for our quality work, because we employ a method known as, gang printing, involving printing large quantities on large sheets of paper, which are then cut down to size. Gang printing reduces the cost of plates and other related fees, which in turn, translates into really low prices for you. PrintFirm, Inc. also now offers in-house mailing services that are targeted, personal, flexible and more affordable than ever! Can I order a lower quantity than what you have listed? No. Our minimum quantity amounts are fixed and we do not offer lower quantities. However, if you were to shop around, you will see that PrintFirm, Inc. offers 500 pieces for less than what most other printing companies offer for 250 pieces. Can I split print quantities? Quantities cannot be split up due to gang-run printing. For example a 500 business card order will be placed on our 500 sheet press run. If you need two names, you will have to place two orders of 500 each. Is there an extra charge for bleed? No. All our prices include free bleed. All bleeds should be 1/8 of an inch (0.125) all around. Generally no. Please do not submit files via email unless you are contacted and given specific instructions on emailing your files. Due to many email viruses, if you submit your order through email they will automatically be deleted and we will not receive your order. Yes. An invoice will be emailed to you, once your order is placed. If you are picking up your order from our Canoga Park office located in California, we will have your invoice available for pickup, upon request. As a registered user of our website, you can always access your account and print your invoice(s) as well as track your order. What do I do if I don't see the postcard size that I am looking for? 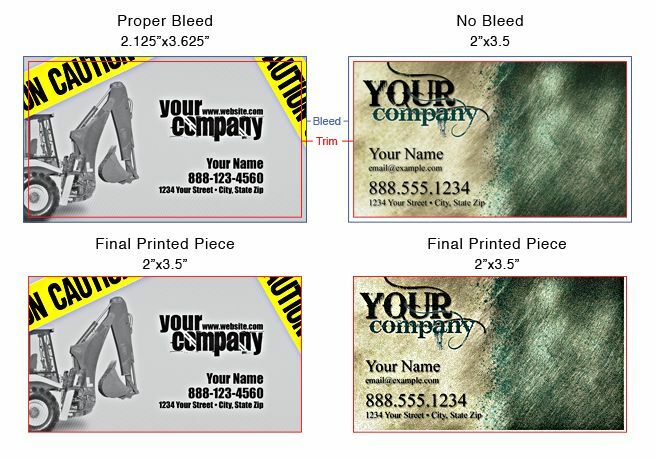 If you don't see the postcard size that you are looking for, you can simply round up to the closest size of Postcard that you are looking for, and then state the final trim size in our "Special Instructions" box on the order form. You may also contact us for a specific quote. What is blind shipping / drop shipping? As far as your clients are concerned, you are the printer! Your order will be shipped with your company name and information as the return shipping address. There will be no invoice, advertisements or promotions packed with your order. Is there a set-up fee for your standard images? No. We do all the work for you. We have over 10,000 pre-designed standard images for you to choose from, so that you do not have to pay for a set-up fee. Should you choose to edit our standard images in any way, including but not limited to, adding a personal photo, or a company logo, a small fee will apply. Fees may vary. What do you mean by (4/0), (4/1) or (4/4)? 4/0 refers to Full Color on the front and Blank on the back. 4/1 refers to Full Color on the front and Black/White on the back. 4/4 refers to Full Color on the front and back. What type of shipping method do you use? We ship everything using FedEx. During Checkout, you can choose FedEx Ground, FedEx 2nd Day, FedEx Standard Overnight, or you may choose to pick up your order from our Canoga Park office in California. Do you offer any discounts or free items? Yes. You can take advantage of a variety of Discounts and Free Products by accessing our website. Can I request a sample for my portfolio? Yes. A few samples of a completed print job maybe mailed directly to the wholesaler for use in a service portfolio, for a small fee. This is referred to as a Portfolio Sample. Generally yes. You may be able to split up your print project, so that different portions are shipped to different addresses. PrintFirm, Inc. will make every effort to accommodate your requested quantity division, but we do not guarantee an exact split. A service fee, as well as, separate shipping fees per address will apply. Fees Vary. What does NBD stand for ? A. Customer submits file(s) by 10:00 a.m. PST, the day before requested Pick-up/Shipping date. B. Customer's file(s) meet our specifications and/or do not require a proof.